Since its inauguration in 1969, ESO’s La Silla Observatory has been at the forefront of astronomy. Its state-of-the-art instruments have enabled astronomers to make fundamental discoveries and paved the way for future generations of telescopes. After 50 years of activity, the La Silla Observatory remains a reference in the field and has recently been given a new lease of life, thanks in particular to the contribution of Switzerland. About eighty astronomers were invited by the ESO to attend a commemorative conference at the end of March in La Serena to mark the 50th anniversary of the La Silla Observatory. “We were able to appreciate the extremely important role that La Silla played for European astronomy, which, in terms of observational resources, was significantly behind American astronomy,” explains Francesco Pepe of PlanetS, one of the main speakers at the conference. 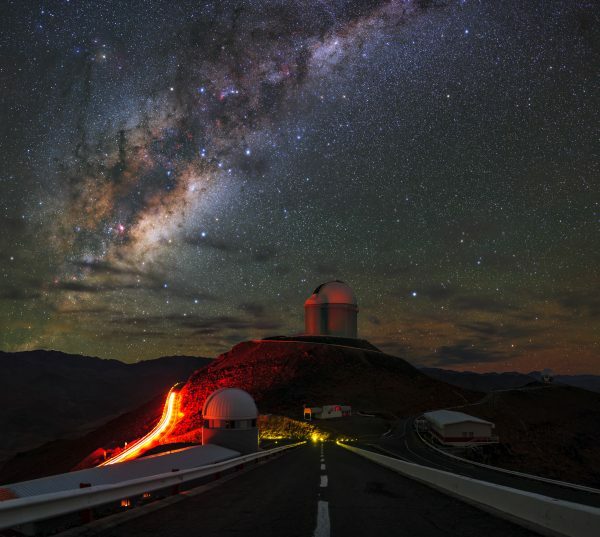 Construction of La Silla began in 1965, three years after the foundation of ESO. The observation and accessibility conditions were considered ideal for the establishment of an observatory that would be a world leader. Observations began with the ESO’s relatively small 1 m and 1.52 m telescopes. The number and variety of La Silla telescopes have increased as the observatory has developed. The 3.6 m which was completed in 1977 certainly remains the flagship telescope of La Silla, indeed equipped with HARPS, the most powerful extrasolar planet hunter in the world, it has allowed the discovery of many exoplanets. The other jewel of La Silla is undoubtedly the 3.58 metre New Technology Telescope (NTT), which has opened new perspectives for telescope design by being the first in the world to be equipped with active optics, a technology that has paved the way for the VLT. Two instruments with which ESO and European astronomy have been able to move up the slope to finish, with the VLT, at the forefront of world astronomy. Despite progress and discoveries, the La Silla observatory almost disappeared. Indeed, after the construction of the VLT in the 2000s, the ALMA and ELT projects, operating costs took off and there was a lot of doubt about the usefulness of La Silla. Observers who went on missions during this period remember a half-abandoned place, an almost empty restaurant and deserted recreation rooms (gymnasium, cinema, reading room, etc. ), what a contrast with the anthill of the 1990s. It was without taking into account the contribution of Switzerland, through the Universities of Geneva and Bern and the discovery of Michel Mayor. “Switzerland, which contributed to the influence of La Silla with CORAVEL, the precursor of Coralie and HARPS, photometry and the first Swiss telescope then EULER, played a fundamental role in the survival of La Silla by developing HARPS and by designing NIRPS,” says Francesco Pepe. In recent years, La Silla has experienced a renaissance, the site now houses 13 operational telescopes, not only from ESO but from countries, universities and collaborations around the world. These telescopes include TRAPPIST South, the REM (Rapid Eye Mount Telescope) and the TAROT telescope dedicated to tracking gamma-ray explosions. As for the two 4 m operated by ESO, they will be dedicated to specific scientific cases, HARPS+NIRPS at the 3.6m telescope for exoplanets and the SOXS spectrograph at NTT to monitor transient and variable astronomical events. “Small and medium-sized telescopes have shown that they are essential to our knowledge of the Universe: they are the ones that allow us to discover and study exoplanets, the first stars born in the Universe, explosive phenomena such as supernovae and to develop asteroseismology,” says André Maeder, former professor of stellar evolution in Geneva. The usefulness of an Observatory that promotes the development of new detectors and instruments before considering their application to very large instruments or space was also highlighted during the various presentations.